Home Blog IP Networks Enterprise Networks Where to use static and where to use dynamic routing? 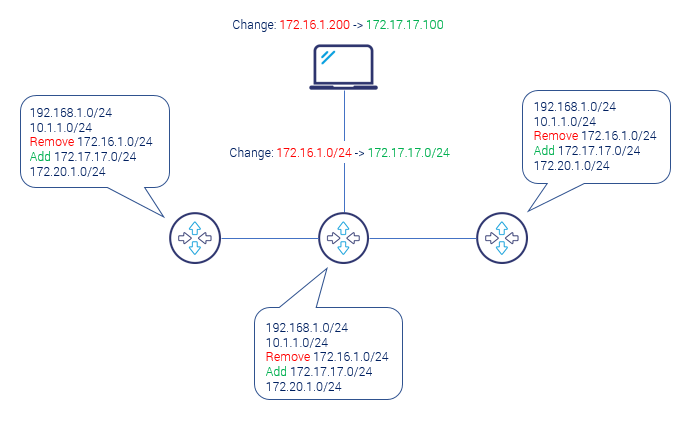 Where to use static and where to use dynamic routing? Routing is the crucial process in IP networks responsible for IP prefix propagation and keeping the whole network topology in order. Having billions of IP addresses divided into many different subnets, without routing there would be muddle that will prevent the whole Internet from working. So, routing is like the set of rules that allows localize particular IP network and IP addresses that belongs to that network. This set of rules needs to be consistent across the whole IP cloud. Look at the below picture and imagine that computers want to communicate to each other. If the laptops have IP addresses from different subnets they have no clue how to get the different address. They will use their default gateways but whats next? The missing mechanism that informs the network how to get to the different IP Networks (known as IP prefixes) is routing. Routing is satisfied by network devices known as routers. Routers route the IP packets traversing the network to right direction based on routing information. So, routing information is about where to send the packet to get to destination. On below scheme, all routers which form a network need to have consistent routing information so that every laptop is then able to communicate with each other. So in our picture if there is only one change of IP subnet address from 172.16.1.0/24 to 172.17.17.0/24, administrator needs to make six operations: remove old prefix, put the new one, and make it three times. 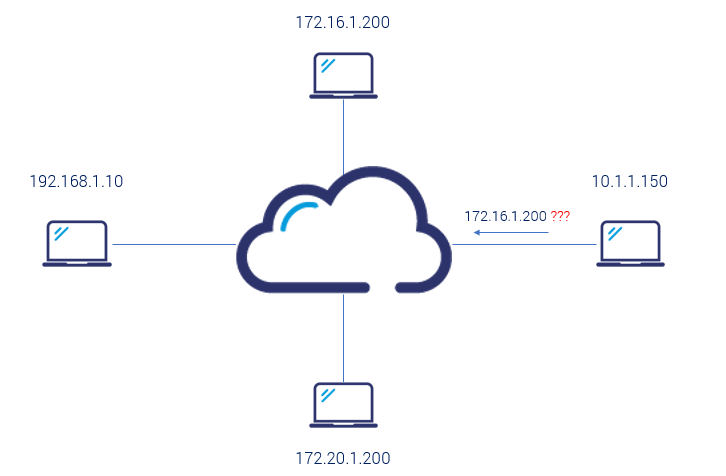 Now, imagine that your network consists of 100 routers and you have to add only 2 new different subnets to the network because there is an opening of new office in your company. You would need to add 200 static routing entries. Imagine another example that there is Internet routing change with thousands of routers managed by different Internet Service Providers and routing tables have over 600 000 prefixes. What is wrong with static routing here? There is one more point related to the static routes problem, that is possibility of routing loops creation by mistake. Yes, that is why we need to use dynamic routing. Example of dynamic routing protocols are BGP, EIGRP, OSPF and RIP that you can choose according to your topology, specific requirements ( like scenario: WAN, Internet Edge, Data Center, SP networks), technical capabilities (vendor, type of devices, supported protocols) and so on. So, where to use static and where to use dynamic routing? Example 1: If you have one router connected to Internet at home, use static route 0.0.0.0/0 pointing to your ISP. You do not need the dynamic routing. Example 2: If you have single link between two locations and you have only 2 networks in location A and 4 networks in location B, use can still use static routing (no big administrative overhead). 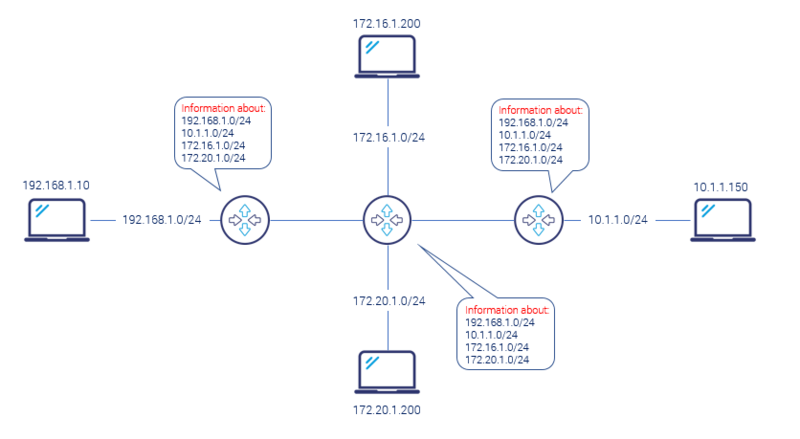 Example 3: If you have WAN network of 10 sites and HQ, and each site has than 10 IP networks and some of them has connections to other sites, use dynamic routing (complexity). Example 4: If you have ISP 1 and ISP 2 and you are responsible for achieving Internet Edge and E-commerce redundancy, use dynamic routing (automation needed). 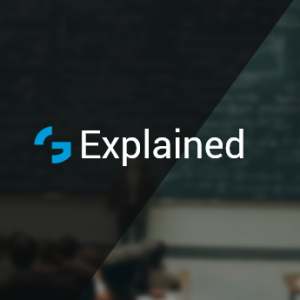 bgp configuration, eigrp configuration, ospf configuration, rip configuration, static route configuration, static vs dynamic routing, what is dynamic routing, what is the difference between static and dynamic routing, where tu use static and where dynamic routing, why to use dynamic routing? I have a situation something like example 4 above. But, for me ISP1 BW is more than ISP2 BW which is more than ISP3 BW. Each ISP IP pool is totally different, no super-netting works. Each ISP is terminated on their own Cisco 2600 router and all the routers are then connected to a Cisco 4500 switch. I have a requirement that some service, running on a single physical machine having two NIC, should primarily be served through ISP1, as it is having highest BW. But, in the event of failure of ISP1, it should automatically be served through ISP2 and than through ISP3 if ISP2 also fails. How to achieve this arrangement? What extra hardware, software and configuration needed? How does routing table work?